Benzyl alcohol, sodium chloride, carboxymethyl cellulose sodium, polysorbate 80, sodium hydroxide, or hydrochloric acid, water for injection. For alleviating the joint pain, swelling and stiffness associated with rheumatoid arthritis and osteoarthrosis, with an inflammatory component; also for bursitis, epicondylitis, and tenosynovitis. Allergic states: e.g. bronchial asthma, seasonal or perennial allergic rhinitis. In seasonal allergies, patients who do not respond to conventional therapy may achieve a remission of symptoms over the entire period with a single intramuscular injection (see Dosage and Administration). Endocrine disorders: e.g. primary or secondary adrenocortical insufficiency. Collagen disorders: e.g. during an exacerbation of maintenance therapy of selected cases of SLE or acute rheumatic carditis. Dermatological diseases: e.g. pemphigus, severe dermatitis and Stevens Johnson Syndrome. Rheumatic, Gastrointestinal or Respiratory disorders: as an adjunctive, short-term therapy. Haematological disorders: e.g. acquired (autoimmune) haemolytic anaemia. Neoplastic diseases: e.g. palliative management of leukaemia and lymphomas. Renal disease: e.g. acute interstitial nephritis, minimal change nephrotic syndrome or lupus nephritis. Epirelefan is for Intra-articular/Intramuscular injection ONLY. The safety and efficacy of administration by other routes has yet to be established (see Contraindications and Warnings and Precautions). Strict aseptic precautions should be observed. Since the duration of effect is variable, subsequent doses should be given when symptoms recur and not at set intervals. For intra-articular administration or injection into tendon sheaths and bursae, the dose of Epirelefan may vary from 5 mg-10 mg (0.125-0.25 ml) for smaller joints and up to 40 mg (1.0 ml) for larger joints, depending on the specific disease entity being treated. Single injections into several sites for multiple joint involvement, up to a total of 80 mg, have been given without undue reactions. To avoid the danger of subcutaneous fat atrophy, it is important to ensure that deep intramuscular injection is given into the gluteal site. The deltoid should not be used. Alternate sides should be used for subsequent injections. The suggested initial dose is 40 mg (1.0 ml) injected deeply into the upper, outer quadrant of the gluteal muscle. Subsequent dosage depends on the patient's response and period of relief. Patients with hay fever or pollen asthma who do not respond to conventional therapy may obtain a remission of symptoms lasting throughout the pollen season after a single dose of 40-100 mg given when allergic symptoms appear. (see Warnings and Precautions). The suggested initial dose of 40 mg (1.0 ml) injected deeply into the gluteal muscle should be scaled according to the severity of symptoms and the age and weight of the child. Epirelefan is not recommended for children under six years. Growth and development of children on prolonged corticosteroid therapy should be carefully observed. Caution should be used in the event of exposure to chickenpox, measles or other communicable diseases. (see Warnings and Precautions). Treatment of elderly patients, particularly if long term, should be planned bearing in mind the more serious consequences of the common side effects of corticosteroids in old age, especially osteoporosis, diabetes, hypertension, susceptibility to infection and thinning of the skin. Close clinical supervision is required to avoid life-threatening reactions. In patients who have received more than physiological doses of Epirelefan (more than one injection during a three week period), withdrawal should not be abrupt. The dose should be reduced and the dosage interval increased until a dose of not more than 40 mg and a dosage interval of at least three weeks have been achieved as the dose of systemic corticosteroid is reduced. Clinical assessment of disease activity may be needed. Patients who have had repeated courses of systemic corticosteroids. When a course of Epirelefan has been prescribed within one year of cessation of long-term therapy (months or years). Systemic infections unless specific anti-infective therapy is employed. Administration by intravenous, intrathecal, epidural or intraocular injection. Do not administer injections preserved with benzyl alcohol to premature infants, neonates, infants, pregnant women, or nursing mothers. Benzyl alcohol has been associated with serious adverse events & death, particulary in pediatric patients (it may cause gasping syndrome). Injections preservative-free should be used in these populations. Adequate studies to demonstrate the safety of triamcinolone acetonide use by intra-turbinal, subconjunctival, sub-tenons, retrobulbar and intraocular (intravitreal) injections have not been performed. Endophthalmitis, eye inflammation, increased intraocular pressure and visual disturbances including vision loss have been reported with intravitreal administration. Several instances of blindness have been reported following injection of corticosteroid suspensions into the nasal turbinates and intralesional injection about the head. Patients should be specifically warned to avoid over-use of joints in which symptomatic benefit has been obtained. Severe joint destruction with necrosis of bone may occur if repeated intra-articular injections are given over a long period of time. Care should be taken if injections are given into tendon sheaths to avoid injection into the tendon itself. Repeated injection into inflamed tendons should be avoided as it has been shown to cause tendon rupture. Due to the absence of a true tendon sheath, the Achilles tendon should not be injected with depot corticosteroids. During prolonged therapy, a liberal protein intake is essential to counteract the tendency to gradual weight loss sometimes associated with negative nitrogen balance and wasting of skeletal muscle. This product contains benzyl alcohol which is potentially toxic when administered locally to neural tissue. Intra-articular injection should not be carried out in the presence of active infection in or near joints. The preparation should not be used to alleviate joint pain arising from infectious states such as gonococcal or tubercular arthritis. Undesirable effects may be minimized using the lowest effective dose for the minimum period, and by administering the daily requirement, whenever possible, as a single morning dose on alternate days. Frequent patient review is required to titrate the dose appropriately against disease activity (see Dosage and Administration). Adrenal cortical atrophy develops during prolonged therapy and may persist for years after stopping treatment. Withdrawal of corticosteroids after prolonged therapy must, therefore, always be gradual to avoid acute adrenal insufficiency and should be tapered off over weeks or months according to the dose and duration of treatment. During prolonged therapy, any intercurrent illness, trauma or surgical procedure will require a temporary increase in dosage. If corticosteroids have been stopped following prolonged therapy, they may need to be reintroduced temporarily. Patients should carry steroid treatment cards which give clear guidance on the precautions to be taken to minimize risk and which provide details of prescriber, drug, dosage and the duration of treatment. Suppression of the inflammatory response and immune function increases the susceptibility to infections and their severity. The clinical presentation may often be atypical and serious infections such as septicaemia and tuberculosis may be masked and may reach an advanced stage before being recognized. Chickenpox and measles are of particular concern since these normally minor illnesses may be fatal in immunosuppressed patients. Unless they have had chickenpox, patients receiving parenteral corticosteroids for purposes other than replacement should be regarded as being at risk of severe chickenpox. Manifestations of fulminant illness include pneumonia, hepatitis and disseminated intravascular coagulation; rash is not necessarily a prominent feature. Passive immunization with varicella zoster immunoglobulin (VZIG) is needed by exposed non-immune patients who are receiving systemic corticosteroids or who have used them within the previous 3 months; varicella-zoster immunoglobulin should preferably be given within 3 days of exposure and not later than 10 days. Confirmed chickenpox warrants specialist care and urgent treatment. Corticosteroids should not be stopped and the dose may need to be increased. Patients should be advised to avoid exposure to measles and to seek medical advice without delay if exposure occurs. Prophylaxis with normal immunoglobulin may be needed. During corticosteroid therapy, antibody response will be reduced and therefore affect the patient's response to vaccines. Live vaccines should not be administered. Patients and/or carers should be warned that potentially severe psychiatric adverse reactions may occur with systemic steroids (see Undesirable Effects). Symptoms typically emerge within a few days or weeks of starting the treatment. Risks may be higher with high doses/systemic exposure (see Drug Interactions), although dose levels do not allow prediction of the onset, type, severity or duration of reactions. Most reactions recover after either dose reduction or withdrawal, although specific treatment may be necessary. Patients/carers should be encouraged to seek medical advice if worrying psychological symptoms develop, especially if depressed mood or suicidal ideation is suspected. Patients/carers should also be alert to possible psychiatric disturbances that may occur either during or immediately after dose tapering/withdrawal of systemic steroids, although such reactions have been reported infrequently. Recent intestinal anastomoses, diverticulitis, thrombophlebitis, existing or previous history of severe affective disorders (especially previous steroid psychosis), exanthematous disease, chronic nephritis, or renal insufficiency, metastatic carcinoma, osteoporosis (post-menopausal females are particularly at risk); in patients with an active peptic ulcer (or a history of peptic ulcer). Latent or healed tuberculosis; in the presence of local or systemic viral infection, systemic fungal infections or in active infections not controlled by antibiotics. In acute psychoses; in acute glomerulonephritis. Hypertension; congestive heart failure; glaucoma (or a family history of glaucoma), previous steroid myopathy or epilepsy. Liver failure. Corticosteroid effects may be enhanced in patients with hypothyroidism or cirrhosis and decreased in hyperthyroid patients. Diabetes may be aggravated, necessitating a higher insulin dosage. Latent diabetes mellitus may be precipitated. Menstrual irregularities may occur, and this possibility should be mentioned to female patients. Rare instances of anaphylactoid reactions have occurred in patients receiving corticosteroids, especially when a patient has a history of drug allergies. All corticosteroids increase calcium excretion. Aspirin should be used cautiously in conjunction with corticosteroids in patients with hypoprothrombinaemia. This product contains benzyl alcohol and must not be given to premature babies or neonates. Benzyl Alcohol may cause toxic reactions and anaphylactoid reactions in infants and children up to 3 years old. Epirelefan is not recommended for children under 6 years. Corticosteroids cause dose-related growth retardation in infancy, childhood and adolescence which may be irreversible, therefore growth and development of children on prolonged corticosteroid therapy should be carefully observed. Amphotericin B injection and potassium-depleting agents: Patients should be observed for hypokalaemia. Anticholinesterases: Effects of anticholinesterase agent may be antagonised. Oral Anticoagulants: Corticosteroids may potentiate or decrease anticoagulant action. Patients receiving oral anticoagulants and corticosteroids should therefore be closely monitored. Antidiabetics: Corticosteroids may increase blood glucose; diabetic control should be monitored, especially when corticosteroids are initiated, discontinued, or changed in dosage. Antihypertensives, including diuretics: Corticosteroids antagonise the effects of antihypertensives and diuretics. The hypokalaemic effect of diuretics, including acetazolamide, is enhanced. Anti-tubercular drugs: Isoniazid serum concentrations may be decreased. Cyclosporin: Monitor for evidence of increased toxicity of cyclosporin when the two are used concurrently. Digitalis glycosides: Co-administration may enhance the possibility of digitalis toxicity. Oestrogens, including oral contraceptives: Corticosteroid half-life and concentration may be increased and clearance decreased. Hepatic Enzyme Inducers (e.g. 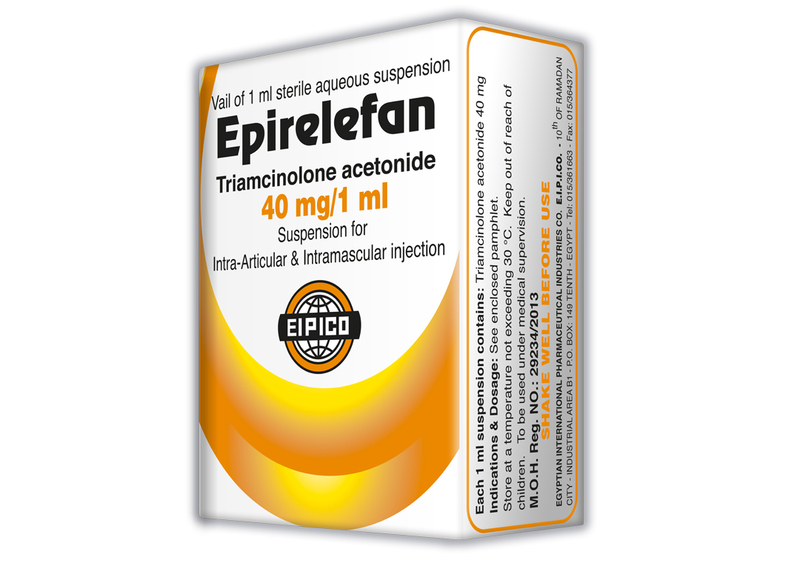 barbiturates, phenytoin, carbamazepine, rifampicin, primidone, aminoglutethimide): There may be increased metabolic clearance of Epirelefan. Patients should be carefully observed for possible diminished effect of steroid, and the dosage should be adjusted accordingly. Human growth hormone: The growth-promoting effect may be inhibited. Ketoconazole: Corticosteroid clearance may be decreased, resulting in increased effects. Nondepolarising muscle relaxants: Corticosteroids may decrease or enhance the neuromuscular blocking action. Nonsteroidal Anti-Inflammatory Agents (NSAIDS): Corticosteroids may increase the incidence and/or severity of GI bleeding and ulceration associated with NSAIDS. Also, corticosteroids can reduce serum salicylate levels and therefore decrease their effectiveness. Conversely, discontinuing corticosteroids during high-dose salicylate therapy may result in salicylate toxicity. Aspirin should be used cautiously in conjunction with corticosteroids in patients with hypoprothrombinaemia. Thyroid drugs: Metabolic clearance of adrenocorticoids is decreased in hypothyroid patients and increased in hyperthyroid patients. Changes in thyroid status of the patient may necessitate adjustment in adrenocorticoid dosage. Vaccines:Neurological complications and lack of antibody response may occur when patients taking corticosteroids are vaccinated (see Warnings and Precautions ). The ability of corticosteroids to cross the placenta varies between individual drugs, however triamcinolone does cross the placenta. There is no evidence that corticosteroids result in an increased incidence of congenital abnormalities, such as cleft palate/lip in man. However, when administered for prolonged periods or repeatedly during pregnancy, corticosteroids may increase the risk of intra-uterine growth retardation. Hypoadrenalism may, in theory, occur in the neonate following prenatal exposure to corticosteroids but usually resolves spontaneously following birth and is rarely clinically important. As with all drugs, corticosteroids should only be prescribed when the benefits to the mother and child outweigh the risks. When corticosteroids are essential, however, patients with normal pregnancies may be treated as though they were in the non-gravid state. Corticosteroids may pass into breast milk, although no data are available for triamcinolone. Infants of mothers taking high doses of systemic corticosteroids for prolonged periods may have a degree of adrenal suppression. Where adverse reactions occur they are usually reversible on cessation of therapy. The incidence of predictable side-effects, including hypothalamic-pituitary-adrenal suppression, correlate with the relative potency of the drug, dosage, timing of administration and duration of treatment. (see Warnings and Precautions). Absorption of triamcinolone following injection by the intra-articular route is rare. Anti-inflammatory and immunosuppressive effects: Increased susceptibility and severity of infections with suppression of clinical symptoms and signs, opportunistic infections, recurrence of dormant tuberculosis (see Warnings and Precautions). Fluid and electrolyte disturbances: Sodium retention, fluid retention, congestive heart failure in susceptible patients, potassium loss, cardiac arrhythmias or ECG changes due to potassium deficiency, hypokalaemic alkalosis, increased calcium excretion and hypertension. Musculoskeletal and Bone disorders: Muscle weakness, fatigue, steroid myopathy, loss of muscle mass, osteoporosis, avascular osteonecrosis, vertebral compression fractures, delayed healing of fractures, aseptic necrosis of femoral and humeral heads, pathological fractures of long bones and spontaneous fractures, tendon rupture. Hypersensitivity: Anaphylactic reaction, anaphylaxis including anaphylactic reactions and anaphylactic shock, angiodema, rash, pruritus and urticaria, particularly where there is a history of drug allergies. Dermatological disorders: Impaired wound healing, thin fragile skin, petechiae and ecchymoses, facial erythema, increased sweating, purpura, striae, hirsutism, acneiform eruptions, lupus erythematous-like lesions and suppressed reactions to skin tests. Gastrointestinal disorders: Dyspepsia, peptic ulcer with possible subsequent perforation and haemorrhage, pancreatitis, abdominal distension and ulcerative oesophagitis, candidiasis. Neurological disorders: Euphoria, psychological dependence, depression, insomnia, convulsions, increased intracranial pressure with papilloedema (pseudo-tumour cerebri) usually after treatment, vertigo, headache, neuritis or paraesthesias and aggravation of pre-existing psychiatric conditions and epilepsy. Endocrine disorders: Menstrual irregularities and amenorrhoea; development of the Cushingoid state; suppression of growth in childhood and adolescence; secondary adrenocortical and pituitary unresponsiveness, particularly in times of stress (e.g. trauma, surgery or illness); decreased carbohydrate tolerance; manifestations of latent diabetes mellitus and increased requirements for insulin or oral hypoglycaemic agents in diabetes, weight gain; Nnegative protein and calcium balance; increased appetite. Ophthalmic disorders: Posterior subcapsular cataracts, increased intraocular pressure, glaucoma, exophthalmos, papilloedema, corneal or scleral thinning, exacerbation of ophthalmic viral or fungal diseases. Others: Necrotising angiitis, thrombophlebitis, thromboembolism, leucocytosis, insomnia and syncopal episodes. On withdrawal, fever, myalgia, arthralgia, rhinitis, conjunctivitis, painful itchy skin nodules and weight loss may occur. Too rapid a reduction in dose following prolonged treatment can lead to acute adrenal insufficiency, hypotension and death (see Warnings and Precautions). Intra-articular Injection: Reactions following intra-articular administration have been rare. In a few instances, transient flushing and dizziness have occurred. Local symptoms such as post-injection flare, transient pain, irritation, sterile abscesses, hyper- or hypo-pigmentation, Charcot-like arthropathy and occasional increase in joint discomfort may occur. Local fat atrophy may occur if the injection is not given into the joint space, but is temporary and disappears within a few weeks to months. Intramuscular Injection: Severe pain has been reported following intramuscular administration. Sterile abscesses, cutaneous and subcutaneous atrophy, hyperpigmentation, hypopigmentation and Charcot-like arthropathy have also occurred. Triamcinolone acetonide is a synthetic glucocorticoid with marked anti-inflammatory and anti-allergic actions. Following local injection, relief of pain and swelling and greater freedom of movement are usually obtained within a few hours. Provides an extended duration of therapeutic effect and fewer side effects of the kind associated with oral corticosteroid therapy, particularly gastrointestinal reactions such as peptic ulceration. Studies indicate that, following a single intramuscular dose of 80 mg triamcinolone acetonide, adrenal suppression occurs within 24-48 hours and then gradually returns to normal, usually in approximately three weeks. This finding correlates closely with the extended duration of therapeutic action of triamcinolone acetonide. Triamcinolone acetonide may be absorbed into the systemic circulation from synovial spaces. However clinically significant systemic levels after intra-articular injection are unlikely to occur except perhaps following treatment of large joints with high doses. Systemic effects do not ordinarily occur with intra-articular injections when the proper techniques of administration and the recommended dosage regimens are observed. Triamcinolone acetonide is absorbed slowly, though almost completely, following depot administration by deep intramuscular injection; biologically active levels are achieved systemically for prolonged periods (weeks to months). In common with other corticosteroids, triamcinolone is metabolised largely hepatically but also by the kidney and is excreted in urine. The main metabolic route is 6-beta-hydroxylation; no significant hydrolytic cleavage of the acetonide occurs. In view of the hepatic metabolism and renal excretion of triamcinolone acetonide, functional impairments of the liver or kidney may affect the pharmacokinetics of the drug. The injection should not be physically mixed with other medicinal products. Store at a temperature not exceeding 30°C. Store in an upright position. Epirelefan Injection: Box containing 1 vial of 1 ml.